INDEPENDENT FEATURE FILMS with Award-winning Film Director/Writer John Gallagher! One on One veteran John Gallagher returns with his popular on-camera Film Improv class, sharing his 35 years of adventures in the movie business. An award-winning writer/director/producer John has cast over 400 actors from his classes, and is well-known for his eye for talent – John Leguizamo, Denis Leary, Amanda Peet, Michael Imperioli, Matthew Lillard, Vincent Pastore, Gretchen Mol, and Zach Braff are among the actors John has cast in debut or significant early roles. His movies, including the indie cult comedy The Deli and the romantic fantasy Blue Moon, have been licensed by HBO, New Line, MGM, Warners/Ryko, ABC, Columbia, Tri-Star and Showtime. He recently directed the features Sarah Q starring five Sopranos and two Oscar nominees, with 17 alumni of his One on One classes, The Networker starring William Forsythe, Sean Young and Stephen Baldwin, and co-wrote and produced the feature comedy Sam (exec produced by the one and only Mel Brooks). John's last three features have all been acquired by Sony companies. 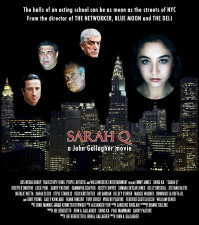 Sarah Q (writer-director-producer). Casting: Caroline Sinclair. The Networker (director). Casting: Donna McKenna. Sam (writer-producer). Casting: Stephen Vincent & Sig DeMiguel. The Insurgents (producer): Casting: Adrienne Stern. Blue Moon (writer-director): Casting: Bonnie Timmermann & Judy Henderson. The Deli (writer-director): Casting: Judy Henderson. Join award-winning director-producer John Gallagher of 305 Media Group for a one two week master class in film improv. Somebody said "Dying is easy, comedy is hard"; the emphasis of the class will be on comedic scenes designed to hone the actor's improvisational skills. Improvisation is an essential tool for the actor. The instructor places a major emphasis on on-camera improvisation as a means to develop the screen actor’s ear, promote creativity, and gain confidence on-camera without the burden of learning dialogue. Additionally, improvisation has become a required skill for industry auditions. Improv is creatively liberating and teaches you to think on your feet – crucial to every aspect of the film actor’s craft, from audition to rehearsal to shooting. BRING HEADSHOT AND RESUME TO CLASS!! One on One veteran John Gallagher returns with his popular on-camera Film Improv class, sharing his 40 years of adventures in the movie business. An award-winning writer/director/producer John has cast over 400 actors from his classes, and is well-known for his eye for talent – John Leguizamo, Denis Leary, Amanda Peet, Michael Imperioli, Matthew Lillard, Vincent Pastore, Gretchen Mol, and Zach Braff are among the actors John has cast in debut or significant early roles. His movies, including the indie cult comedy The Deli and the romantic fantasy Blue Moon, have been licensed by HBO, New Line, MGM, Warners/Ryko, ABC, Columbia, Tri-Star and Showtime. He recently directed the features Sarah Q starring five Sopranos and two Oscar nominees, with 24 alumni of his One on One classes, The Networker starring William Forsythe, Sean Young and Stephen Baldwin, and co-wrote and produced the feature comedy Sam (exec produced by the one and only Mel Brooks). He was recently honored at the Cutting Room with a career achievement award for directing; his next feature is the gangster comedy All Mobbed Up.